Juneous R. Hinshaw4,7,8,9 [Junius R. Hinshaw5,10,11]. Hinshaw, Junius R., son, age 26, born Sep 1873 in North Carolina; parents born in North Carolina; married 1 year; occupation: farm laborer. Hinshaw, Edna R., daughter-in-law, age 19, born Feb 1881 in North Carolina; parents born in North Carolina; married 1 year; no children. Hinshaw, Junius R., head-of-household, age 36, born in North Carolina; parents born in North Carolina; first marriage, married 10 years; occupation: farmer, general farm; rented home. Hinshaw, Edna, wife, age 29, born in North Carolina; parents born in North Carolina; first marriage, married 10 years; 5 children, 4 living. Hinshaw, Luella, daughter, age 9, born in North Carolina; parents born in North Carolina; attended school. Hinshaw, Russell, son, age 7, born in North Carolina; parents born in North Carolina; attended school. Hinshaw, Hubert, son, age 3, born in North Carolina; parents born in North Carolina. Hinshaw, Edith, daughter, age 2, born in North Carolina; parents born in North Carolina. Hinshaw, Junius R., head-of-household, age 46, born in North Carolina; parents born in North Carolina; rented home; occupation: farmer. Hinshaw, Edna, wife, age 39, born in North Carolina; parents born in North Carolina. Hinshaw, Louellen S., daughter, age 19, born in North Carolina; parents born in North Carolina. 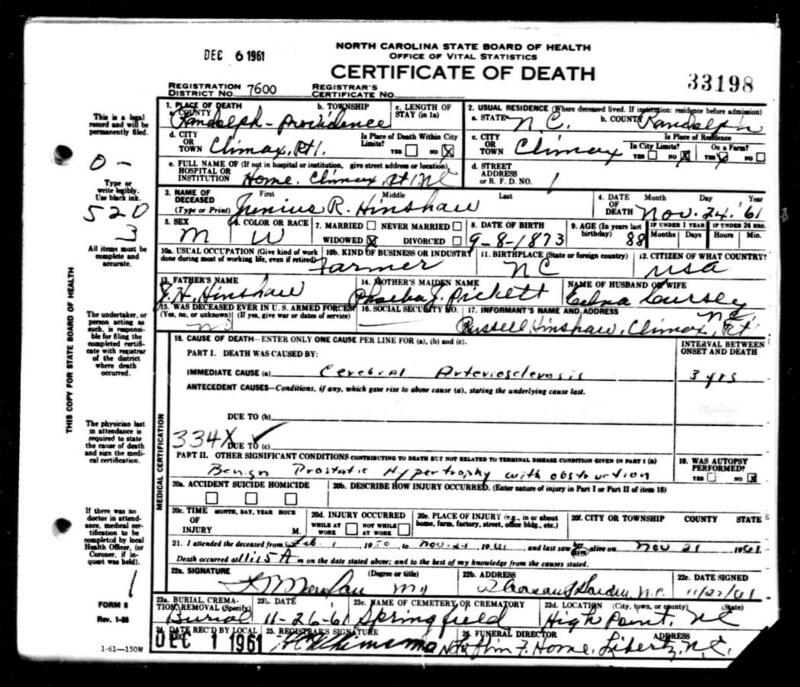 Hinshaw, James R., son, age 17, born in North Carolina; parents born in North Carolina. Hinshaw, Joseph H., son, age 13, born in North Carolina; parents born in North Carolina. Hinshaw, Milton H., son, age 10, born in North Carolina; parents born in North Carolina. Hinshaw, Junius R., head-of-household, age 56, born in North Carolina; parents born in North Carolina; first married at age 27; owned home; no radio in home; occupation: farming, general farming; not a veteran. Hinshaw, Edna E., wife, age 48 [unclear], born in North Carolina; parents born in North Carolina; first married at age 19. Hinshaw, Sarah L., daughter, age 29, born in North Carolina; parents born in North Carolina; single. Hinshaw, Milton H., son, age 19, born in North Carolina; parents born in North Carolina; single. 1910 census, Archdale, Trinity Township, Randolph County, North Carolina; roll T624-1128, ED 99, page 41A, line #1, dwelling #396, family #397. 1920 census, Jamestown Township, Guilford County, North Carolina; roll T625-1302, ED 165, page 7B, line #90, dwelling #138, family #138. 1930 census, Providence Township, Randolph County, North Carolina; roll T626-1715, ED 24, page 5A, line #22, dwelling #82, family #83. Contribution from Cameron Hunt (). Contribution from Crystal Harvell citing: family bible. "Encyclopedia of American Quaker Genealogy", by William Wade Hinshaw, in many well-stocked libraries. 1880 census, Cedar Grove Township, Randolph County, North Carolina; roll T9-978, ED 220, page 156A, line #1, dwelling #117, family #117. 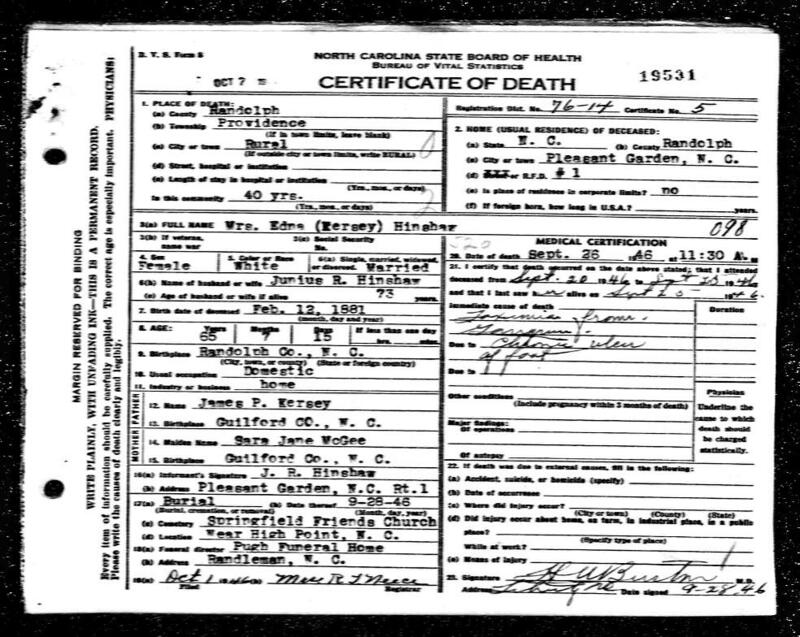 North Carolina Death Certificates, 1909-1975; http://www.ancestry.com. 1900 census, Trinity, Trinity Township, Randolph County, North Carolina; roll T623-1213, ED 98, page 19B, line #86, dwelling #361, family #364. 1930 census, Providence Township, Randolph County, North Carolina; roll T626-1715, ED 24, page 5A, line #26, dwelling #82a, family #83a. 1930 census, Providence Township, Randolph County, North Carolina; roll T626-1715, ED 24, page 5A, line #7, dwelling #77, family #78. Contribution from Cameron Hunt () citing: gravestone. Photo courtesy of Cameron Hunt ().